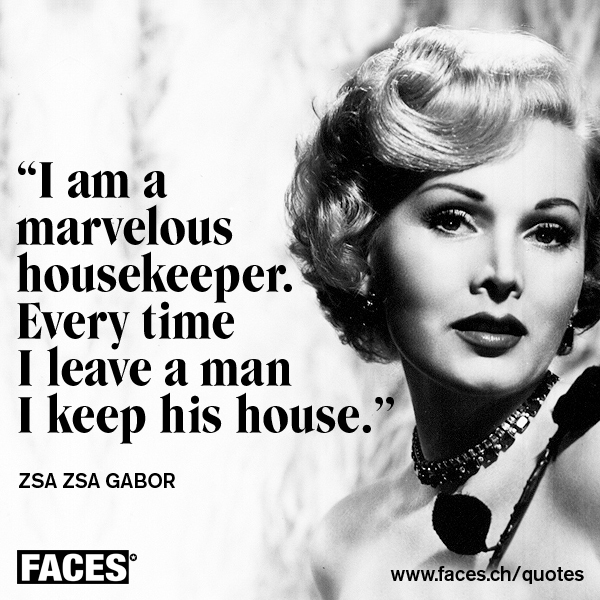 It’s not just Bunny Walters and ZsaZsa Gabor that have gone to meet their maker in the last few days – it is the building at 61 Molesworth St that is quickly shuffling off this mortal coil. They say that modern buildings have a 50 year life span – Zsa Zsa got to 99, Bunny got to 63 – but ICI only just passed 50. Almost reaching its 54th birthday, ICI House was issued with a building consent on 24 Jan 1964, to Fletcher Construction. And, ordered to be demolished after the discovery of a “vertical beam” that had “shorn off” according to an excited and rather confused Fire Chief after the November 14 quake. We all, in the construction business, heaved a sigh of exasperation and said in a loud stage whisper “its not a beam, you idiot, its a frikken COLUMN” and it sounds like it had exhibited shear-axial failure* – the concrete fractured away and the steel reinforcing was left unsupported. We (the public) have not been privy yet to the knowledge as to what particular column had cracked up under pressure, although I am presuming that it may have been somewhere near the link to the stair/lift core? Does that giant muncher machine have a camera up near its teeth I wonder? It is almost certainly not a column in the actual stair core itself, as that is now the only piece of the puzzle still standing. Very bloody strong too. 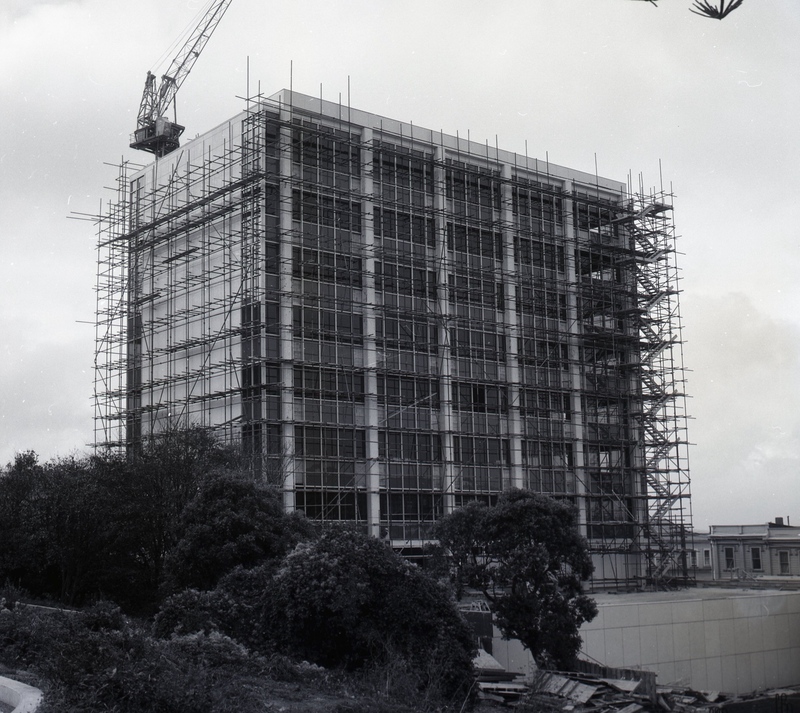 Someone at the WCC Archives has very thoughtfully sought out and sent through to the Eye of the Fish a few of the construction photos of the building under construction in 1964 (thank you – very kind!) and so I include them here, along with a couple of snaps i took over a week ago – and some more I took just yesterday. It was Sunday, so no work on site, but it was also very windy, so loose building materials were sort of flapping around and occasionally breaking loose and flying down to earth. The construction process was certainly more orderly than the deconstruction process! 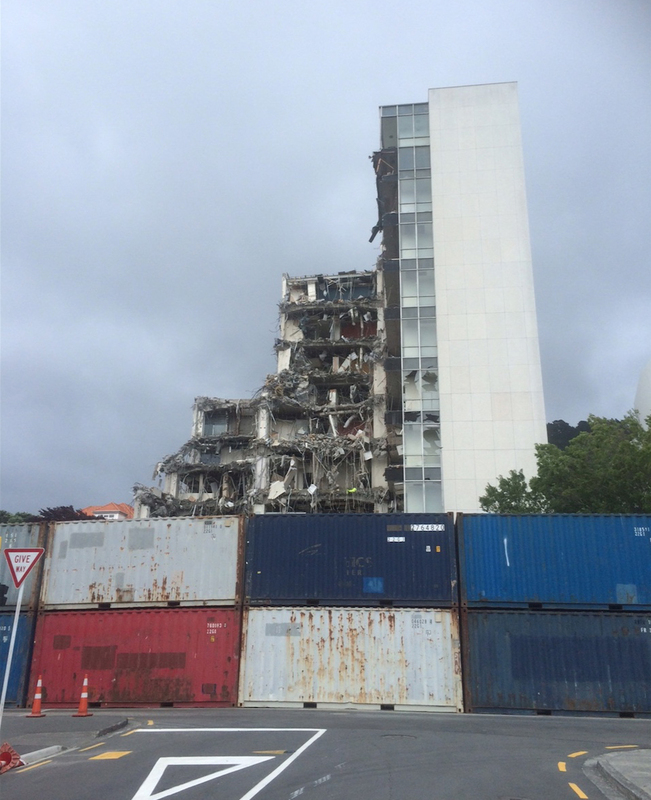 Concrete, steel, aluminium and glass, along with a smattering of fibreglass batts and the odd bit of timber – these are the things that our modern buildings are made of, and what our town dump is evidently going to be full of. It doesn’t appear as though anything is going to be recycled or is recyclable – it is all just a big ugly tangled mess, shoved into the back of a large truck and carted off to the landfill. Mixed in with that is the remains of a resident flat or two, courtesy of the goodness of the heart of the Prime Property group, who had leased a few areas of the building for people to live in. Quite a humanitarian response I would have thought, although the city council are tut-tutting away about how wicked this was. Still: off to the dump it goes. So much for a green city, well known for its attitudes to recycling. 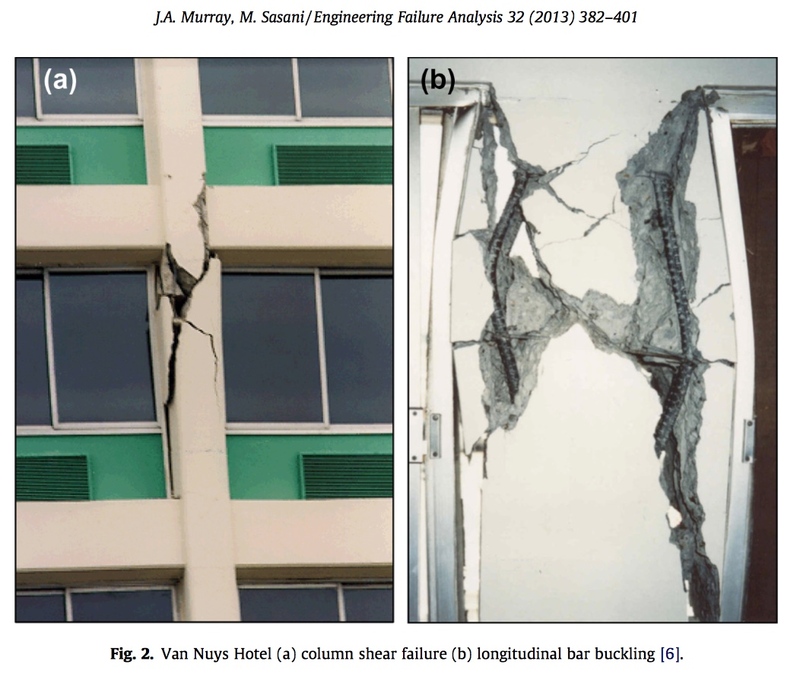 If you want to learn more about column collapse, then I recommend having a read of this paper: “Seismic shear-axial failure of reinforced concrete columns vs. system level structural collapse” (2013) by Justin A. Murray and Mehrdad Sasani at the Department of Civil and Environmental Engineering, Northeastern University, Boston, MA, United States. Published by Elsevier here. It explains it all so much better than I can – and to help explain it even further, I hope that Murray and Sasani don’t mind if I show a pic from their paper, purely as a public information exercise. Here are two of their examples: A) column shear failure, and B) longitudinal bar buckling. “Column shear-axial failure in existing vulnerable reinforced concrete (RC) frame buildings constructed before the mid 1970s is a major seismic risk. Evaluating near-collapse performance of structures requires reliable prediction of their collapse resistance. Progressive collapse is defined as the propagation of an initial failure to other elements, eventually causing collapse of an entire structure or a disproportionally large part of it.” p382. “Removing two out of the three columns on one side of the building by implosion results in only 6.35 mm (0.25 in.) of vertical displacement . In this building, it is shown that Vierendeel frame action, which is characterized by double curvature deformations of beams and columns, redistributed gravity loads away from the damaged region. These experiments have shown structures’ ability to redistribute the gravity loads after a column failure (explosion), even when examining non-ductile pre-1970s building construction.” p385. “The most important observation in the case of the Van Nuys Holiday Inn Building is that the structure did not collapse. Although there were structural failures in various locations throughout the building, the structure was able to redistribute the lateral and gravity loads to the elements that are away from the damaged area. This is a system-level response, due to surrounding columns, floor slab, spandrel beams, as well as the interaction between them” (p383). So: in California, also home to the same Pacific ring of fire that we inhabit, their earthquake damaged buildings remain: they repair their buildings rather than knock them down. There is no doubt that this building (ICI House) was damaged, but we have only heard of one column that broke or “shorn off”. Is that not repairable? Certainly, on the Readings carpark, apparently they have discovered that 11 out of 15? 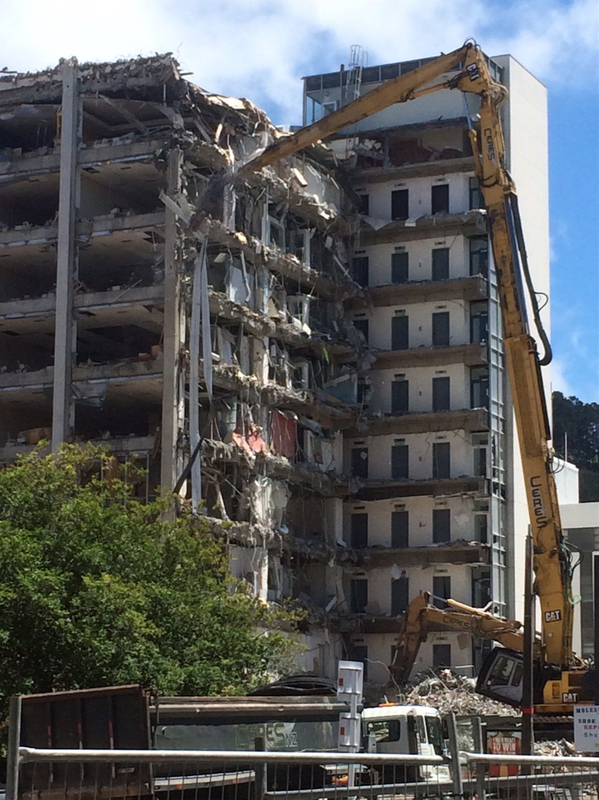 columns have suffered significant structural damage, so definitely : off with its head. And body. And feet. But in the case of ICI House, so evidently still standing strong despite the “monster crushing machine” attacking it for 3 weeks now, was this really the right response? Column shear-axial failure does not necessarily constitute structural collapse. A column failure leads to an increasing shear demand in columns above and below. Columns above a failed column become significantly more susceptible to failure. Shear-axial failure of columns over the same column line is not significantly damaging. Axial failure of a column causes an immediate drop in compression of columns above. And here the WCC orders / requests property owners of another 80 buildings, to do more tests on their precast-slab floors in their buildings. Essentially – pull up the carpets in the corner, and look for cracks. What do they do if they find the cracks? Here’s a couple of questions. 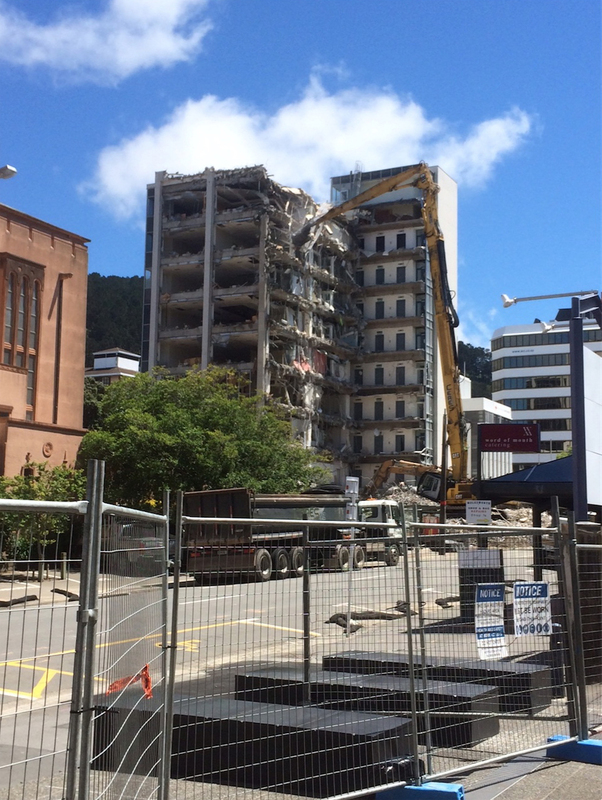 How many buildings currently undergoing deconstruction, remedial work or tagged for further investigation were yellow or red-stickered prior to Kaikoura? 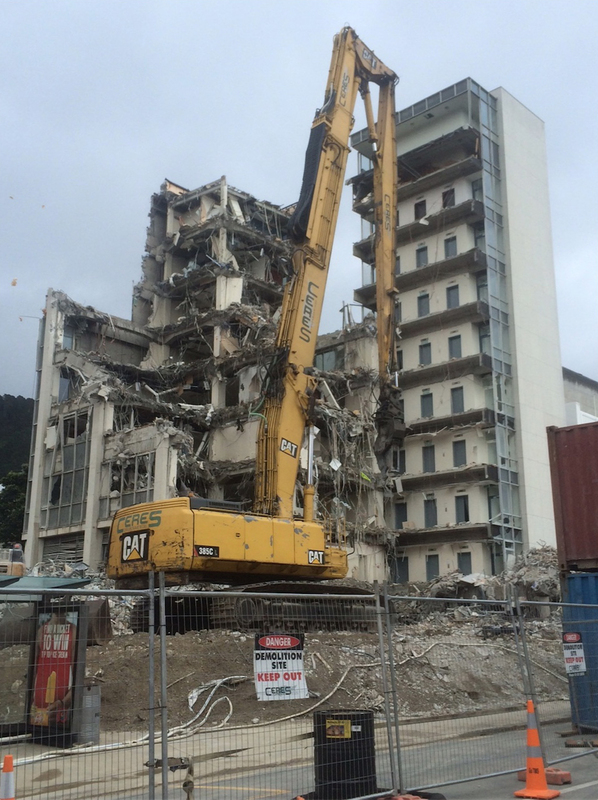 How many previously yellow or red-stickered buildings have shown signs of damage since Kaikoura? Starkive – I’m not able to source that info, but my feeling the answer to both of your questions is: none. For various reasons, involving distance from source, periods of resonance, soil conditions and resonant frequency of buildings, the smaller, brick, earthquake prone buildings in Cuba St, Newtown, Courtenay Place etc, were not affected at all by the Kaikoura quakes. But bigger buildings, especially in the 5-8 story range, started bouncing around and were far more affected than had been planned for. All those new 80 buildings on the list for checking: not on the EQP list before. Nothing against engineers, bless ’em, but I do wonder if the capriciousness of seismic forces and the historical record are sufficiently acknowledged in the cut and thrust of official risk assessment. 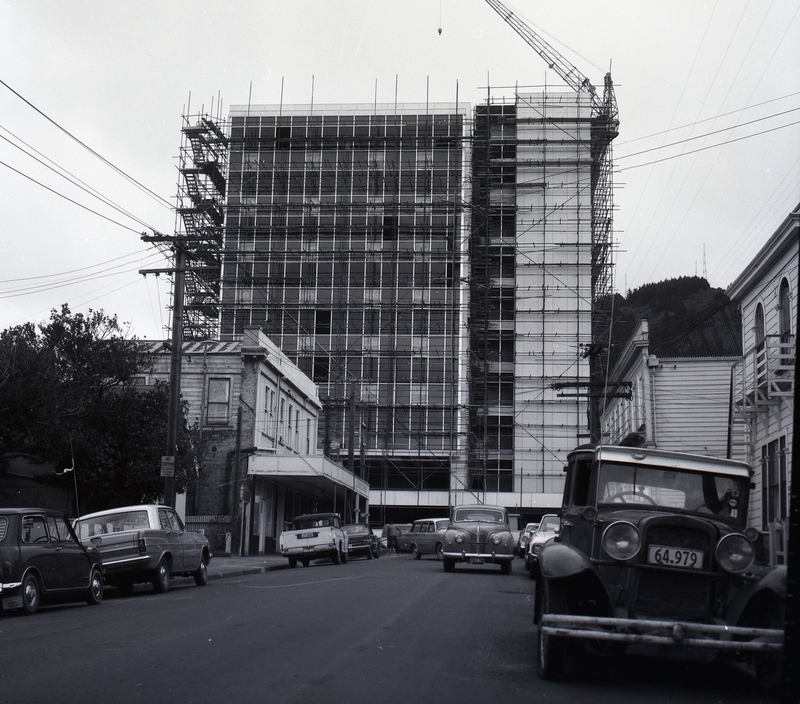 We know that the one-storey, bright green weatherboard and brick laundry in upper Cuba St was standing more or less upright before and after the 1942 shake, for example. Yet it was stickered (and strengthened?) 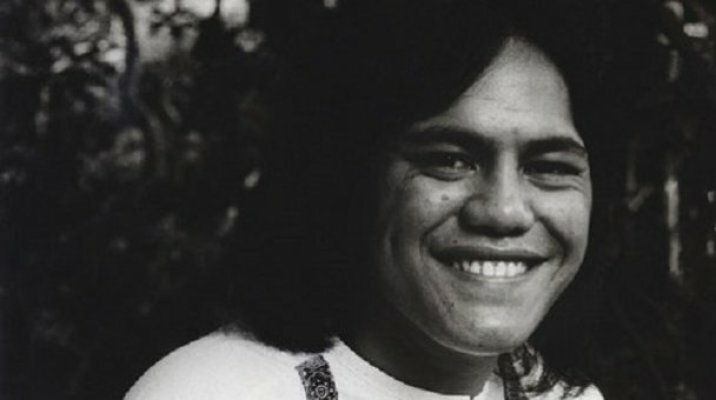 a few years ago. How could it have been a bigger threat to life and limb than most of its neighbours? Merry Christmas to you Starkive – yes, I know what you mean about the Laundry building – I recall when it was being strengthened that some rather large steel beams and columns went into it, for the tiny size of the building. But then again, it was only being held up by the grace of God. I think the issue often is that there may be some small element eg a parapet at risk, but that can still set off a Yellow Sticker notice. There doesn’t seem to be a way of differentiating between whole building EQ Prone-ness, and partial EQ Prone – if you know what I mean. Anyway : time to put the feet up and enjoy some off time. Indeed Professor, that is great news. I wonder where Prime Property will put it? It’s quite a lovely mural in its own eccentric manner, maybe it could remain on site until they build a new tower?